I told him that it is my earnest endeavor to see that it does. I would like very much to ensure—and in some cases I have—that any man who offers violence to his fellow citizen begets a whole lot more in return than he can enjoy." Fever swamp spreads! UC fires limerick big guns in response! Yes, limericks vs. haiku elegies for Osama! I'm simply astounded. Osama bin Laden was the founder and leader of Al Qaeda, and mastermind of the attacks on the U.S. embassies in Tanzania and Kenya, the attack on the USS Cole, the 9/11 attacks, and much other murderous mayhem. So how is it that someone who is not a jihadist would be deeply disturbed that Osama bin Laden was finally killed? What kind of person is it whose first reaction to OBL finally getting his well-deserved demise is livid rage? A Rockwellian, that's what kind. I'll document and comment on some of their vile craziness soon. But the reaction of Robert Higgs of the Independent Institute is even more bizarre. In response to the news that bin Laden was finally brought to justice (yes, it is just to kill murderers, and I suppose I'll have to post on this later as well) Higgs wrote "Osama's Been Killed -- Ten Haiku", in which he laments the killing of bin Laden and appears to predict the destruction of the United States by Pakistan. Needless to say, "we" at Unforeseen Contingencies couldn't let his pseudo-Japanese doggerel go unchallenged, and so we've let fly on in his comments section with a couple examples of our own pseudo-Irish efforts. Higgs is, as it turns out, a fellow-traveler and occasional "scholar" of Rockwell's inaptly-named Mises Institute, i.e. a bile-filled lunatic who confuses hatred for anything and everything done by the U.S. government with principled love of liberty. Make that pretends to confuse; these scoundrels understand very well what they are doing. I was and am completely opposed to the invasion of Iraq, I was skeptical of the invasion of Afghanistan (because I doubted that Bush would pull it off successfully and not turn it into a quagmire). I was and am completely opposed to the PATRIOT Act and all the rest of the homeland security authoritarianism. The proper response to vicious criminals like bin Laden is anger, followed by relentlessly hunting them down and finishing them. Liberty and civilization depend on this. Higgs' handwringing laments and self-righteous indignation are immoral. Osama bin Laden -- good riddance! We at Unforeseen Contingencies are extremely happy at the news that Osama bin Laden has been killed. There's no question that he led a terrorist organization that happily slaughtered the defenseless at random, all in the name of establishing religious dictatorship. (It's necessary to mention this only because of the battiness of the "Truthers".) It's always appropriate to kill homicidal sociopaths, and particularly political ones. 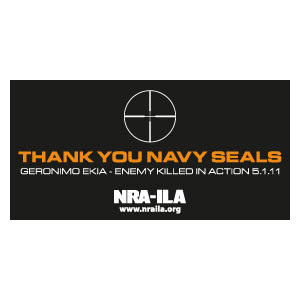 I'm extremely pleased that it was Navy SEALs who shot him, and not a drone missile. There's some satisfaction that this scoundrel was hunted down in his own home. Good riddance. May Muammar Qaddafi join him soon! Fever Swamp update: the Rockwellites are ballistic over the death of bin Laden, and going beyond what even I thought them capable of -- they really are lamenting the murder of poor Osama bin Laden!